ELO Engineering, Inc. has more than 40 years of experience providing CNC machining and sheet metal fabrication services, and we’ve invested millions of dollars in both our staff and facilities to ensure we deliver the precision parts our customers demand. We offer CNC machining services for businesses in a wide variety of industries, from medical and agricultural to aerospace and transportation. And since we’ve achieved ISO 9001:2008 certification and AS 9102 compliance, all of our customers can rest assured we’ll deliver the high quality parts their projects require. ELO offers our customers far more than simple CNC machining. 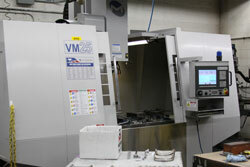 We provide turnkey product solutions that save our customers time and money on their parts programs. Our team can provide and manage a wide range of additional services, inducing welding, tooling, metal powder coating, assembly and kitting. We can also provide advanced engineering support to help lower costs and improve your components’ performance. All of our services are preformed using industry best practices such as kanban and lean manufacturing principles, so you can count on ELO to not only produce high quality parts, but lower your production costs as well. We also understand that having parts built to print isn’t very useful if they don’t arrive when you need them, which is why we use integrated forecasting in our CNC machine shop to ensure on-time delivery for our customers. For more information on any of our CNC machining and sheet metal forming services, or to request a quote, contact ELO Engineering, Inc. today.